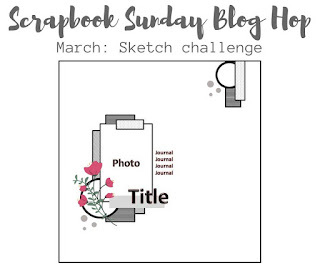 Tina's Crop Shop: March Scrapbook Sunday Blog Hop with Sketch Inspiration! 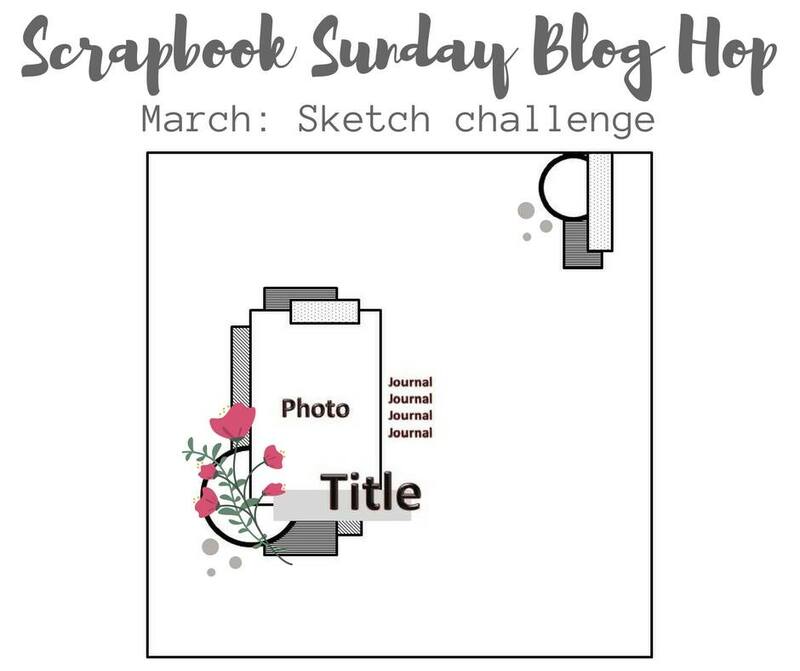 March Scrapbook Sunday Blog Hop with Sketch Inspiration! Hello and welcome the March Edition of Scrapbook Sunday Blog Hop! This month we have a very cool scrapbook page sketch to inspire you! So I ordered one of those DNA kits from Ancestry.com a couple of months ago and I recently received my results along with some DNA matches of probable 3rd and 4th cousins. It was all very interesting so I decided to start a Family Tree on their website. One thing led to another and before you know it I was about 5 hours into it one evening and was mesmerized by all of the information available on their website. One of the coolest things that I saw was a scanned copy of my Grandparents wedding license... how awesome is that??!! As I was deciding what photo to use on my page I ran across this picture of those same Grandparents at their 50th Wedding Anniversary and was excited to use it! Of course I'm still using the fabulous Sweet Soiree Embellishment Kit! It was perfect for adding some fun cake and floral layers to my page. Since the picture is an old one I really wanted to give the page a subtle vintage background look. I used Crumb Cake to sponge the edges and used stamped off Crumb Cake and Powder Pink to stamp the new SAB "Eclectic Expressions" images on the background. I pulled out the awesome Number of Years stamp and Die set for the 50th anniversary title..... I love this set!!! I also used the Celebrate You Thinlits for the "amazing" over the 50th Anniversary because anyone that makes it to a 50th must be amazing! Thanks so much for stopping by! Below is our blog roll with all of the other Bloggers listed.. remember you are at Tina Riddle's blog now so just click the next in line. How much fun is this, Tina?!?!? Thank you for sharing the back story and your fun exploration of your heritage. Wonderful page, Tina and Thank you for sharing your inspiration. 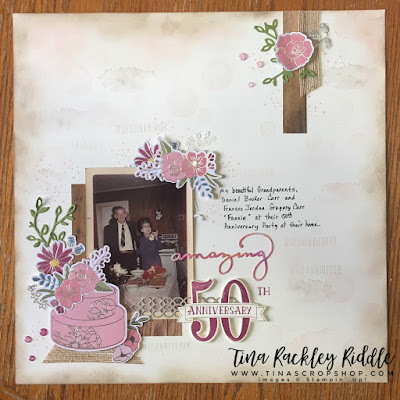 The colours are just stunning <3 Such a special occasion to scrap and FOREVER record these memories...Have fun Tina with your family history it is almost as time consuming and FUN as scrapbooking is! !